Have you seen the film 'Only Loves Left Alive'? It screened in early 2014 and is now out on DVD, iTunes and so on (Update! On Nexflix now too, at least in Canada). 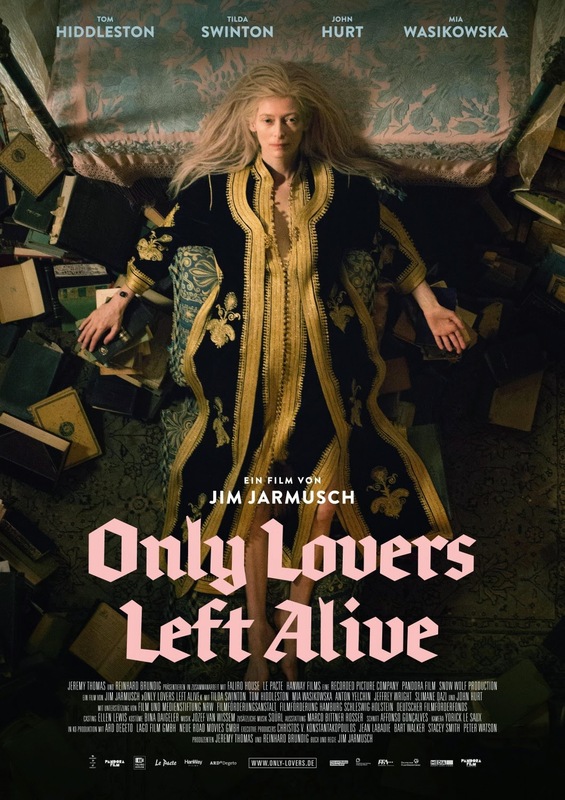 I wanted to write a little something about 'Only Lovers Left Alive' because it is so rare for me to find a film that I've enjoyed as much as this one. This is a vampire movie (the trailer oversells that fact). I expected the film to be a generic horror melodrama. Surprise! 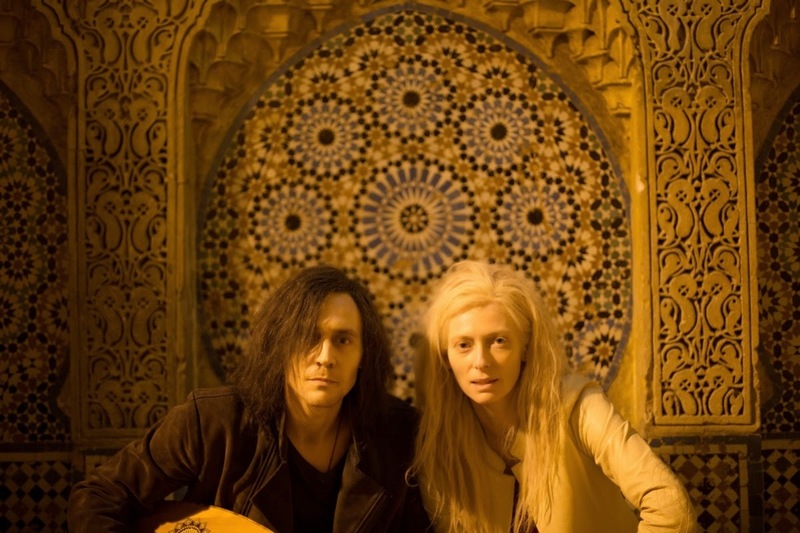 OLLA turned out to be a sweet romance with many oddly funny moments, too. The vampire stuff was secondary. Tilda Swinton combines her regal alien beauty with rock chick swagger - so perfect for a vampire. Tom Hiddletson became a very big name as a scene-stealer in comic book movies but I'm old school so I remember him as tactless, snarky Martinsson on Wallander. They were both excellent in this film: I have officially bought into the Hiddleston hype. Adam and Eve are an adoring vampire couple who have been married for centuries. The 2,500 year age difference is not important: their chemistry is obvious. They are a true ying and yang pair. Eve is vibrant, a literary connoisseur who lives in Tangier. She is fascinated by everything and everyone she observes around her. Adam is a heavy-hearted musician living in an abandoned part of Detroit, hidden away from the 'zombies' (ie. humans like us). He is finding his immortality to be a little too much to bear. Who says vampires can't be clinically depressed? It's up to Eve to keep him going. This is a film about the mundane moments in the lives of extraordinary beings. It asks, what keeps you interested in life if you're immortal? Art? Science? Love? 'Only Lovers Left Alive' is definitely not for everyone, as the reviews calling it dragging, pretentious and indulgent will show. However, I loved drifting through this charming, gorgeous, strange story and dwelling in the mood for a long time afterwards. Filmwell posted a thoughtful and detailed review of OLLA here. Note: if you're considering watching OLLA solely for that famous Hiddles smile, be warned that there is but one in the entire film and it was relegated to a deleted scene. I'll save you some time: here it is. Not a spoiler. Informant #1: "I didn't actually meet him! I was so starstruck and intimidated I couldn't even make eye contact. All I could do was gaze! To be fair to myself, I was also trying really hard to be professional, since I was technically there as a consultant - I had to crush my inner fan girl. He seemed pleasant and laid back and gorgeous. He was much taller than expected. He was very tall, looked kind of Edgar Allen Poe-ish with black hair, a Victorian suit and the little round Victorian sunglasses. You can see why I was a little intimidated....but he didn't act snobby or anything he was smiling and chatting with people and very professional." Informant #2: "I tried very hard to get his autograph in Hamilton and stood in line for hours but to no avail. He was actually so polite: he was taking 10 minutes with each person and posing for photos with babies and dogs etc. But he drove past us leaving the park and I honked and he looked at us and waved! Sadly for me, I realized on account of bridge construction when he was filming in Hamilton that he was likely passing my house every day. My front yard was covered in bathroom reno stuff and looked super low rent. The thought of him seeing my ghetto front yard on a daily basis really irks me. He is a very huggy person - very physical - even with complete strangers. He was not in costume. They'd finished filming and I guess it was a meet-and-greet thing that they had organized on account of so many people wanting to see him. I think he stood there for hours and hours and hours. He had been there for hours already before I even knew he was down there and we were there for at least two. Very patient, lovely, very genuine and open - never seemed grumpy about the fact that he was standing next to a washroom in a public park for like five hours." Sounds like a good sport. I'm intrigued. I too am very selective about movies and don't often find ones to rave about.